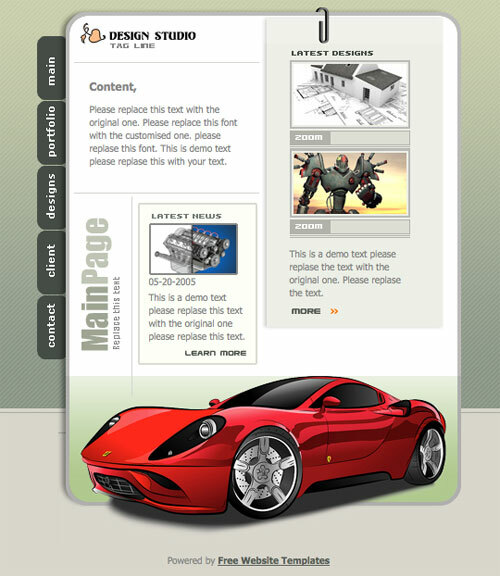 Discussion in 'Free Website Templates' started by Mimoun, Sep 7, 2005. Please put some pages, because I can't customize that model. 1-2 page in i-frame, will be good..
Just copy the page and remove the content and add your own text. Nice, but it would look cooler bigger. thanks for nice template how about picture if i want to change picture how can i sir? Just open it with a html editor like Dreamweaver and delete the pictures and add your own. Please, anyones knows what are the Fonts names? Im not sure if its possible to see the font names that are missing with photoshop, would be cool to have the fonts already within the .zip (if they are free), you guys already share the psd, why not the fonts? In photoshop when you click on the text with the font missing it should say the Fonts name. Very nice template. You did a gret job. and just curious can u edit it with like frontpage or somthin like that? yeah i like this template also anyway can you tell techniq why u can run it all type of browser like this. some time i did webtemplate when i ran on IE it is good but when i ran it on Firefox have something wrong. why like this can you tell me sir: thanks before hand. Steve. Can We Change The Turtle Pic? I have seen this template floating around for some time now. Its nice to finally track down the creator. Great Design. Keep it up. It comes with a PSD file, so I started up Photoshop CS3 and started whacking away. Only to come to realize that it doesn't have any slices defined. So then I think maybe I need to define my own. But the problem with that is then the whole thing is saved as a bunch of images, and I no longer have any text on the screen. So then I saw that I should just open it up on Dreamweaver. Ok, I did that. But then I can't edit things like the logo. They show up as a .gif file. I can't edit a .gif file. So I have the whole page as a source PSD file, and I have the elements as raster images. How do I edit these pages. For instance, what if I want to keep everything else the same but I want to change "Design Studio" to "Fresh Sheets"? Thanks for any assistance and a great template. Again, I am somewhat of a noob, so if I am missing something simple, don't assume I know it.